There are so many ways to enjoy the convenience of your EID (Electronic ID) at the Club. You can use it to check in at our Front Desk, use a daily locker, make purchases at the Rochester Athletic Club, or sign in automatically to the Preva personalized fitness experience on our Precor networked equipment: ellipticals, bikes, AMT (Adaptive Motion Trainer), or treadmills. Your EID comes in three convenient forms – a wristband, card, or fob. Please watch the short video below to unlock even more of what your EID can do for you! How old do you need to be to get an EID? Members 13 years and older receive an EID when they join the club. Children younger than 13 may receive an EID at the discretion of their parent/guardian(s). If you are a member and have never received an EID, we provide your first EID free - just ask at the Front Desk. Please note that a child is not able to charge purchases to their account with an EID unless their parent or guardian has set up charging privileges for that child on their member account. This can be done through the Front Desk or Business Office. What happens if I forget or lose my EID? In either case, you may borrow a temporary EID for the day at the Front Desk. This EID will be checked out to you and must be returned by the end of that day to the Front Desk or you will be charged $10. If you borrow a temporary EID and have a permanent locker, our Manager on Duty (MOD) will need to unlock your permanent locker. If you have joined the RAC Perks program and have accumulated enough points, you may be able to redeem points for a new EID. Please redeem in advance so that the perks certificate has time to get to the Front Desk. There are times when lost EID’s get turned in. In this happens, we will look up who it belongs to and attach a note to your screen and give it to you the next time you come in. If someone should find a lost EID they would not be able to use it to enter the club or make a purchase as a picture comes up for verifying identity in these cases. If you have purchased another EID, it is linked to your account and your old EID would not be linked to you or work in the club. How do I set up my EID to allow me to sign in to the Preva system on the Precor equipment on the Fitness Floor? The Fitness Desk staff will be happy to help you to set up your EID so that you can use it to automatically sign in to the Preva networked fitness system. All it takes to set up is holding your EID band, card or fob over the lit green reader on the upper right hand side of the Preva console. Once the EID is read, the display will lead you through the set up. Either enter your existing Preva account and password or set up a new account by providing your email address and setting up a password. Once you have the EID associated with an account you no longer have to type in your email and password to sign in. Instead, you can simply scan your EID over the green reader. You may also link your own personal accounts to supported apps like Netflix, Hulu, and Spotify, so that every time you use your EID to sign in to the Preva system, you will also be automatically signed in to those accounts if you wish to use them. 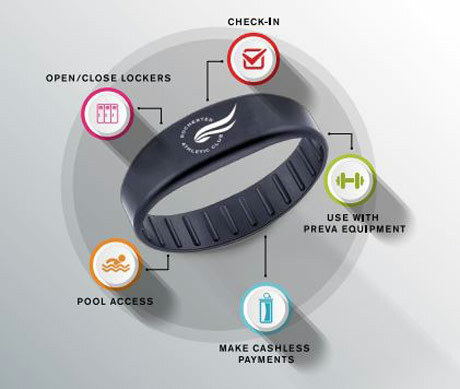 Click here to learn more about what the Preva networked fitness system offers.